I’d bet there was a hastily called meeting at NBC News yesterday morning after Megyn Kelly said she doesn’t understand what’s wrong with white people dressing up for Halloween in blackface. 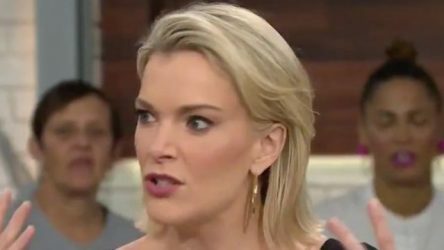 I haven’t seen Kelly’s ratings lately, but if they are still as low as they were several months ago, the network may have been looking for an excuse to cut her free and, if these idiotic remarks turn into a bigger controversy, this could be it. From the moment her much-hyped Sunday night show (remember that?) died a horrible short-run death, everyone at NBC must have realized what a mistake it was to bring her on board with hopes she’d drag her Fox News fans along with her. Instead, all she’s done is hurt the image of the extended “Today” show — and that’s saying something, considering that Kathie Lee Gifford co-hosts one of those hours! By the way, later in the day, Kelly (who once told her FNC audience that Santa Claus — a fictional character! — should always be depicted as a white man) issued the kind of “apology” to her colleagues that you only write when management forces you to. We’re now less than two weeks away from election day, and I’m not hearing a peep about the Parkland kids who survived the shooting at their school and started the #NeverAgain movement. Considering how they got tons of press in the weeks after the incident, and some on their summer bus tour across the country, it’s telling that they’re not even a blip on the election coverage radar these days. True, there are other stories hogging all the attention — both real and manufactured — but these kids were supposed to be the leading edge of a movement that was going to energize young voters and have a real impact at the ballot box this year. If that’s still true, it’s a pretty well-kept secret.